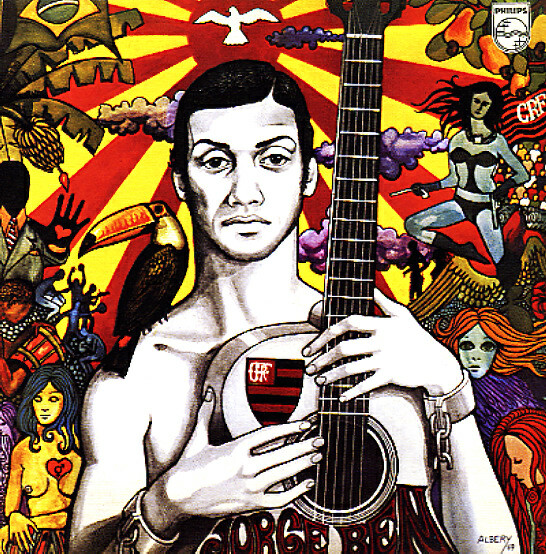 A samba soul masterpiece from Jorge Ben – one of the most brilliant records to come out the fertile late 60s Brazilian scene – and an incredible album that works with the psychedelic flourishes of Ben's contemporaries and a deeper undercurrent of soul & funk! This is one of the most amazing early Jorge Ben LPs, recorded at the end of the 60s, when Jorge was singing with a stone-cold soul sound. The sharp, tight arrangements by Rogerio Duprat & Jose Briamonte made tracks like "Pais Tropical", "Take It Easy My Brother Charles", and "Que Pena" immediate classics – while the percussion and rhythms of Trio Mocoto provide a good part of the unique backdrop. The album is a mix of funky samba, soaring Brazilian soul, and sweeping orchestrations that give the whole thing a jazzy finish – and it's some of the best work that Jorge Ben ever recorded! Other tracks include "Criola", Cade Tereza", "Domingas", "Barbarella", "Quem Foi Que Roubou A Sopeira" and more. © 1996-2019, Dusty Groove, Inc.